A day we shall never forget. Because is just too sweet. Sundays without Flamengo in the field are critical days. The traditional routine of milllions of Brazilians is broken and the energy normally chanelled towards the countless logistics related to going to the stadium or even the preparation for the long stay in the couch to watch the game on TV are dispersed. In the Sundays without Flamengo, the red-and-black fan crawl up the walls and starts philosophizing about fundamental questions like: What came first, Flamengo or Brazil? Why are we so huge? And so on. Today, you can’t even waste too much time answering what is more important, Flamengo or the National Team. The answer is obvious. The phenomenon is ancient and the neither Ricardo Teixeira (president of the Brazilian Soccer Federation), nor Dunga (Brazil’s Coach, whose nickname is the name of one of the seven dwarves) nor Snow White is to blame. The National Team lost its national significance to most Brazilians a long time ago. The modern Brazil National Team is structured around players with talent, but with no charisma who, save some exceptions, were never able to create ties or identification with their teams of origin. These multimilionaire Playmobils really could not satisfy fans of rival teams. Because of that, with exception of the World Cup (a tournament condemned to ostracism in times of debil nationalities), the Brazilian does not see himself represented by the National Team. Exactly the opposite happens with Flamengo. Flamengo, that for the fools is only a team, it is really a nation. A nation that grows every day. I know that my level of Flamengo Craziness does not allow me to be an example for anybody, but I feel a lot more Flamengo that Brazilian since I can remember. An I know that there is a lot of other people, balanced and so-called normal people, that feel the same. To compare Brazil with Flamengo is not even fair. The Red-and-Black Nation is more perfect in its organization, more fair in its division of responsibilities and duties of its citizens and, specially, it does not support the odious division of classes. And, of course, does not punish the poor with the onus of the dubious honor of paying the bill for nationality. For these and other reasons is that Flamengo is my country. Egalitarian and ecumenic, the Red-and-Black Nation shelters all under its gigantic flag. Here, under this red and black light, nobody is better that anybody. We are all Flamengo, but today, despite of the Joven Pistolero, I am going to root for Brazil to hurt Chile. Only Juan can’t get hurt. Is it clear now the order of importance? 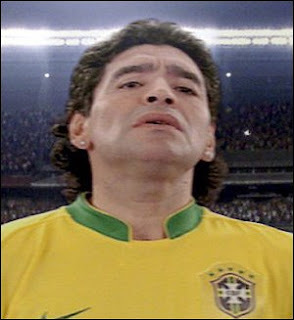 Maradona, the most brazilian of argentinians! We finally can stop fearing the AFA! Maradona, the new coach for Argentina.